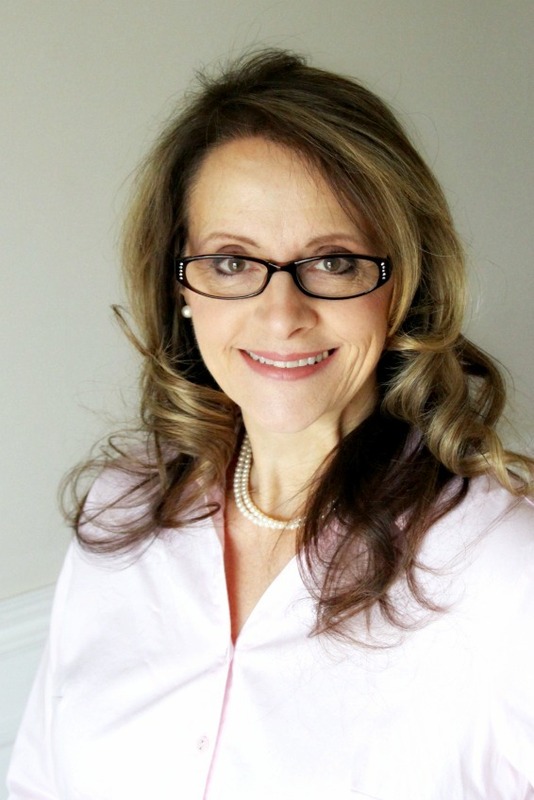 A number of years ago, Sweet Kathleen @Cuisine Kathleen hosted her third annual, St. Patrick’s Day Blog Crawl linking lots of great St. Patrick’s Day posts. 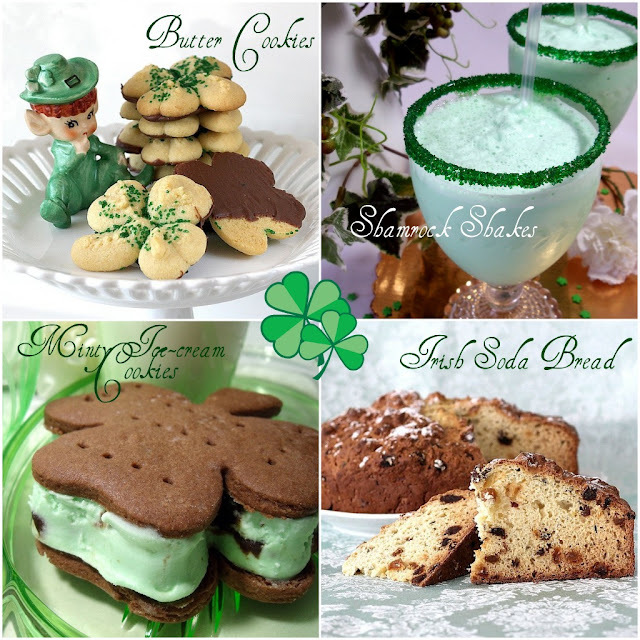 I am sharing recipes for Buttery Shamrock cookies, Shamrock milkshake, minty ice cream sandwiches, Irish soda bread and a crocheted Shamrock garland. I have but one St. Patrick’s Day decoration… this little leprechaun that belonged to my mom. This year I crocheted a shamrock garland similar to the blue heart garland I made for Valentine’s Day. Scroll down for the pattern. Chain 4, join with a slip stitch in first chain to form a ring. Stem: Chain 6, sc in 2nd chain from hook, and slip stitch in remaining four chains. Fasten off. Weave in ends. Ch 12, sc in the top of right side of shamrock petal, chain 2, sc on the left side of top of shamrock petal. Ch 12, sc in the top of right side of shamrock petal, chain 2, sc on the left side of top of shamrock petal, chain 12, continue until all shamrocks are joined. Seriously wow, love all of your photos! Taking notes. 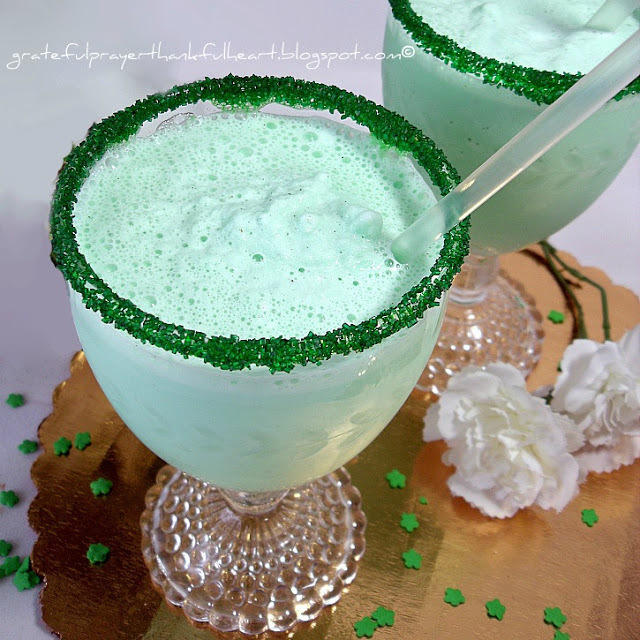 Thanks for adding this fun and beautiful post to the St. Patrick's Day party! Hi L! What a great selection of yummy looking desserts and sweet decorations! Thanks for joining my party, so glad you did! OMG! Beautiful pics of that wonderful and yummy food. Can I come over and have some of those sandwich cookies, some shamrock shakes and maybe a few of butter cookies…on second thought I just became your newest follower and maybe you can come and visit me as I may save myself some pounds! You're very welcome. Have a blessed St. Patrick's Day. This photo mosaic is so pretty and festive. 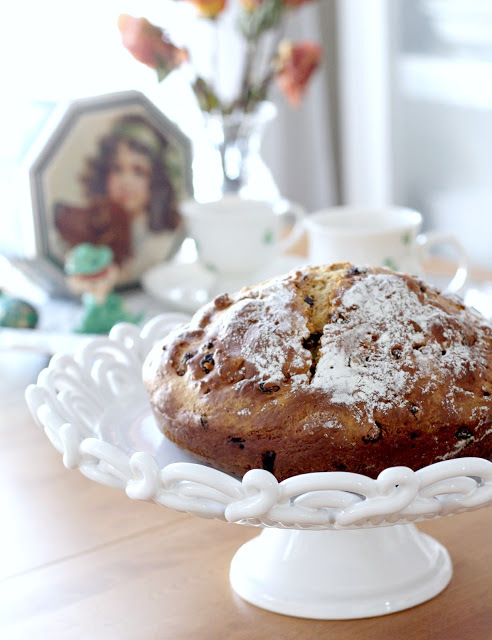 I want to learn making soda bread. The one in your pictures looks so delicious. I will give it a try. Oh, YUM!! And there goes the diet! 🙂 The icecream sandwich cookies look especially delicious! Happy St. Patrick's Day to you!! Everything looks so delicious too…especially that shamrock shake! I'd so much love one! Your garland is adorable and I'd like one of each item on the food menu please:@) Happy St. Patrick's Day! Mmmmmmm, yummy ! I think I gained a couple of pounds looking at your goodies! You are so festive ! Your collages a such fun to look at- great job with your photography as usual! Have a wonderful week! And Happy St. Patrick's Day! 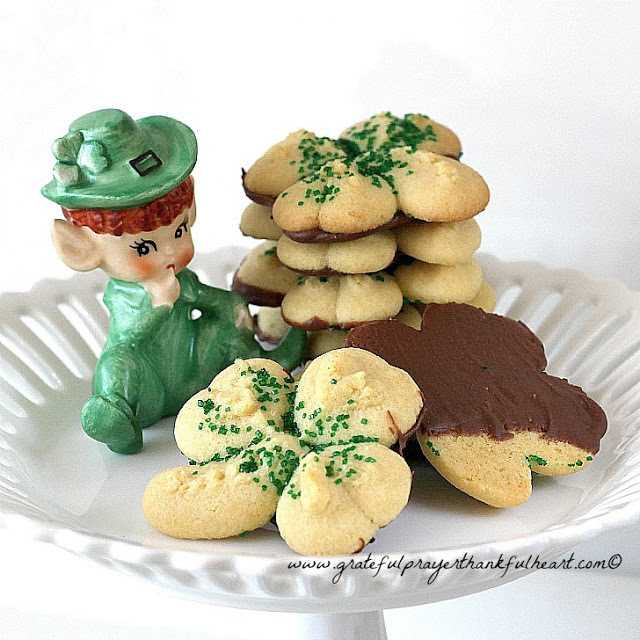 Wow thanks for sharing such tasty looking Irish treats! Beautiful pictures and leprechaun. Must try some of those recipes too. WOW!!! You really outdid yourself this week with two grate collages. The first one is so festive and the second is festive and yummy. The St. Patrick’s Day celebrations are such fun. I so enjoy them. Love the sound of the recipes. Thanks for sharing them with us. This is inspiring! Happy St. Patrick's Day to you! Everything looks so good and the photos are just fantastic. Will Raider be dressed in green?? ive my eyes on the minty icecream cookie! what a thick layer of icecream! yum! great mosaic…i gotta learn how to put my photos together like that! How fun to have your mom's little Leprechaun. A perfet choice to guard your cookies. 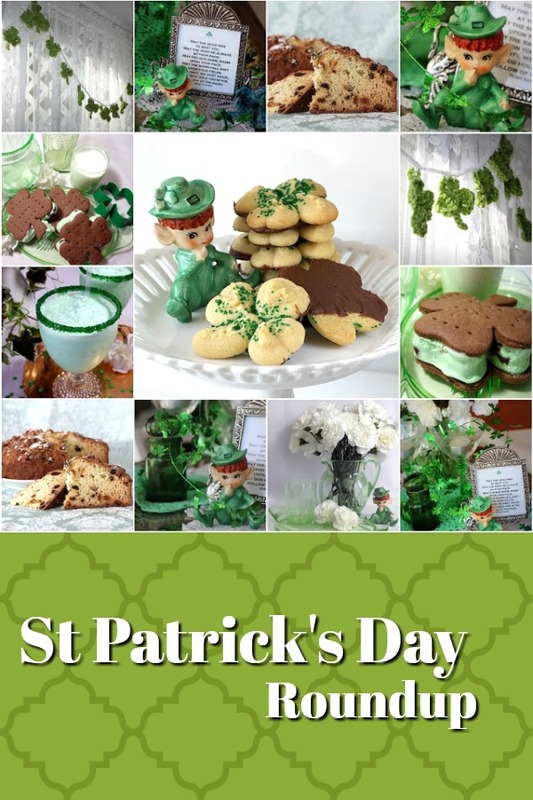 Thanks for joining in and linking up to my St Patricks Day bloggy carnival. Your mosaic looks wonderful and love the crocheted garland. What a lovely assortment of green goodness. I love the mosaic. 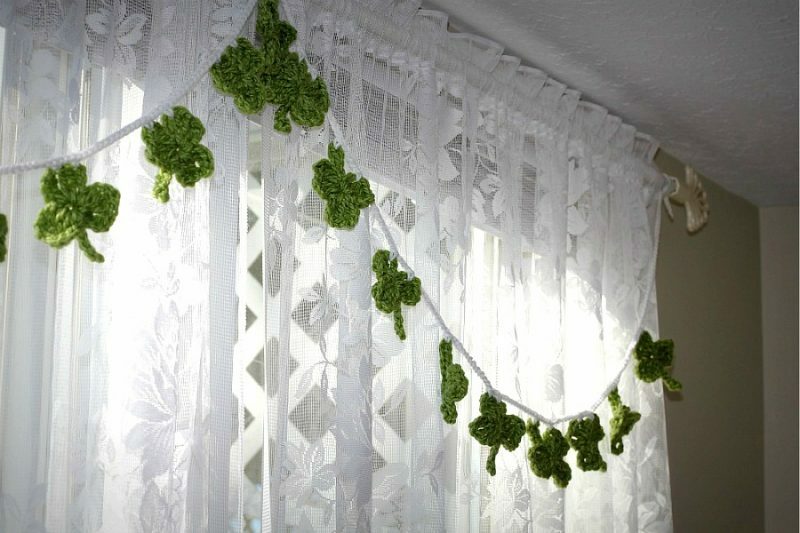 What a beautiful job you have done with your St. Patrick's Day decorations. The mosaic is fantastic! Thank you for sharing. What a fun mosaic. Love it, a great tribute to St. Paddy's day. A fabulous St. Patrick's Day mosaic. I'm going to try your recipe for Irish soda Bread, the one I've used is kind of dry and I like the idea of sour cream added. Wonderful mosaics to mark a great occasion. 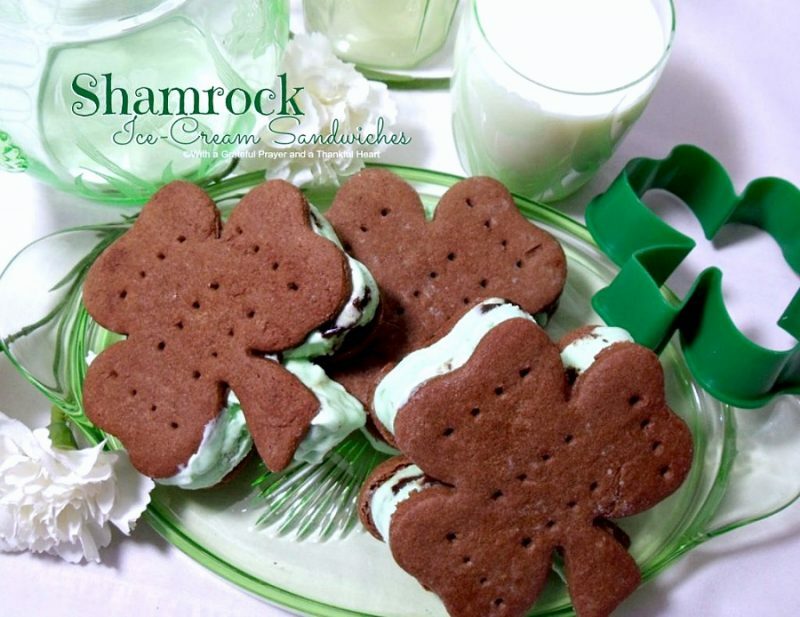 Think I'll have to try out that Minty Ice-cream Shamrock Cookie recipe. How precious! I often forget about this holiday. Everything looks simply delish. Oh my how tempting all your treats are. Wonderful mosaic! Happy St. Paddy's Day to you!!! What a festive mosaic, I love it! Especially the little leprechaun! Adorable!